Monster CEO talks high-res audio, cables and the infamous "Beats sound" | What Hi-Fi? Monster CEO talks high-res audio, cables and the infamous "Beats sound"
It's easy to forget that the $500 million business that is Monster Inc. began when a mechanical engineer (and failed country rock drummer) decided to launch a range of speaker cables. And Noel Lee, the man behind it, remains committed to delivering the best possible sound. Monster is probably better known, certainly in AV circles, for two things: launching Beats by Dre headphones and the infamous, bass-heavy Beats sound. 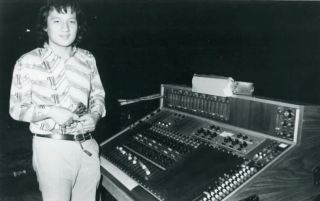 But Noel Lee (pictured above, in a studio in the '70s) is a self-confessed audiophile and audio obsessive. Albeit one who clearly realises the equal importance of knowing your audience. Asked about the 'Beats sound' ("the Beats sound is the Monster sound, it's our sound not their sound"), Lee is well aware of the connotation, not least among more discerning listeners. "It was designed for the music Dr. Dre made, the music Eminem made," Lee tells What Hi-Fi?. "We wanted to bring the sound of studio monitor speakers to portable audio. One thing that the likes of Sennheiser and Bose didn't have is bass. We were the first to create not just deep bass but tight bass." And before you scoff: the original Beats by Dre headphones received a five-star verdict when we first reviewed them back in 2008 (subsequently dropped to four as a result of new competition). But too much bass? "A lot of people said too much bass. It's not audiophile, it was designed for music for the club." There's certainly no arguing with the results: the headphones sold by the bucket-load and Beats by Dre has since been acquired by Apple in a $3 billion deal, which Lee describes as "the steal of the century". So, is there still more life in the headphone market? And does Monster need a new talisman to replace Dr. Dre? Yes and no. Monster does still sell celebrity-branded cans, but Lee is clear it's not the influence it once was. Monster has its eye on a new section of the market. MORE: Do all footballers wear Beats by Dre headphones? At the other end of the market from budget buds, Lee is keeping an eye on high-resolution audio. “For an audiophile like myself, the best quality audio is always of interest. Whether it's of interest to the average consumer... I hope so but I don't hold out much hope. The consumer has to choose between convenience, price and quality." Lee isn't convinced by the mass market potential. "Sony is tinkering around with it, like with SACD and DVD-Audio... If Apple gets into it, gets high-res in to its ecosystem, then that says to 300 million people, it's important. There would be a rush of interest." Sadly, the iPhone 6 launch mentioned no such interest from Apple. The new Monster SoundStage multi-room system can stream high-res audio however, one advantage Lee believes his product has over the market-leader, Sonos. While the high-res movement sits on the backburner for Monster, the company looks to more traditional product areas to keep things ticking over. Like cables. The product category which started it all. So what does Lee say to cable sceptics, notably on the subject of digital cables? "We know every cable makes a difference," he says bullishly. "In the analogue world it was what people said it was, it was hard to measure, hard to prove. In digital we can put a cable on an analyser, we can see the bandwidth, see the amount of errors, see proof that there is a difference. "And people still don't believe that, because they still get a picture. So why pay more? Here's why you pay more. Because technology grows and there are major leaps forward. The straw that was OK for technology five years ago, isn't OK for the future." But what about wireless? Will that ultimately spell the end for wire? "We thought we'd be out of the wire business by now because of wireless. But it has to be as good as wired. 4K video over wireless technology?" Lee doesn't look convinced, but he appreciates the way the market works. "Convenience will ultimately triumph, if it's good enough. But there will always be purists.” Amen to that.